It is a sign of how business minded the British fashion industry now is that, just as Milan has Gucci and Prada slugging it out, London has its very own handbag wars. The prize money is considerable: 51% of all British women bought a handbag last year, contributing to a UK accessories market worth £2.7bn. Equivalent figures for the sale of ironically deconstructed sweatshirts and one-legged trousers are unavailable, but handbags are key to fashion’s bottom line. 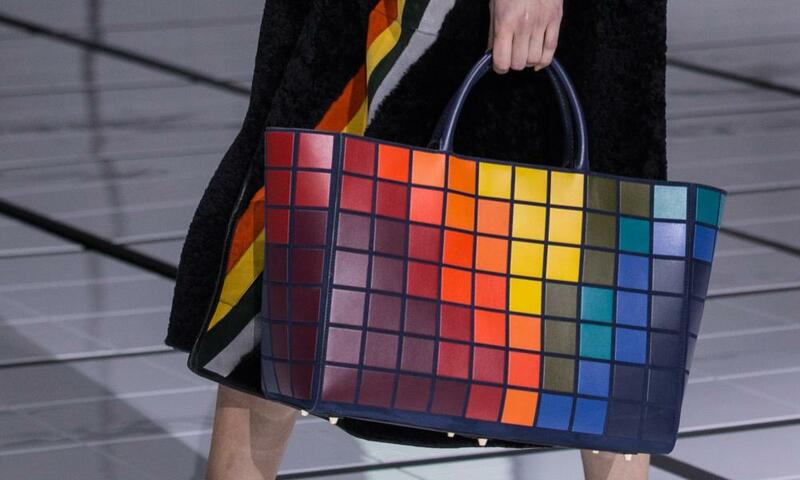 On Sunday at London fashion week, three labels went head to head in the battle to create this season’s It bag. Mulberry’s return to the catwalk on Sunday was a high-stakes affair. This was the brand’s first full fashion show for three years, and followed a string of dismal sales figures from which it is only just starting to recover. New designer Johnny Coca is credited with the cult Trapeze bag from his time as accessories designer at Céline, but unproven as a brand’s overall creative director. What’s more, Mulberry and the two other London labels showcasing their handbags on Sunday – Anya Hindmarch and Hill & Friends – come to the contest with scores to settle with each other. While Mulberry was effectively out of the game, Anya Hindmarch annexed the fashion bandwidth which that label once owned: catwalk stunts (a London gay men’s choir in hi-vis) and amusing accessories (smiley face stickers, lucky dice charms) to sprinkle practical handbags with fun dust. And last year, Emma Hill launched Hill & Friends, whose Mulberry-esque shapes and signature smiley face lock pick up where she left off when she stepped down as Mulberry’s creative director in 2013. Would Mulberry’s return muscle the others off its patch? The answer was no. Mulberry, smartly, has moved on. While Anya Hindmarch and Hill & Friends go head-to-head over the luxury-with-a-sense-of-humour market that once belonged to Mulberry, Coca played his debut for fashion points, not for laughs. The dogs-on-the-catwalk larks of the Hill era have been written out of history, along with the logo associated with that period, which has been replaced by an older version in elegant font. Classic Mulberry bag shapes that pre-date Hill’s tenure – the Bayswater, designed by Stuart Vevers in 2006, and the arch-shaped Colville from 1975 – have been revived, but with the construction altered for a more refined look – for example, the handles on the Bayswater are now slimmer and attached in such a way that they don’t flop when the bag is put down. The vintage Mulberry shapes are mixed with a Céline-ish attitude which delights in the unexpected, the slightly “off”: there are flashes of green snakeskin and punky yellow, outsize silver chains, bags with leather panels that come apart using press studs. Mulberry is back, but not quite as you know it. In fashion, which thrives on newness, that’s a good thing. It would be churlish not to warm to Hill & Friends, with its “Fashion just got friendlier” motto. The Happy Factory, a short film made for fashion week, introduced the Happy Zippy Bag, the Happy Night Out Bag and the rest of the label’s second collection. But while the message is sweet, it is also familiar: this is an aesthetic which has barely moved on, and the brutal truth is that fashion needs to be a bit cooler than this. Anya Hindmarch’s show, entitled Talk Nerdy to Me, was a much slicker take on fashion for fun. It took motifs from early-era gaming – Pac-Man, Space Invaders, Tetris – to create an aesthetic that was both graphic and playful. There were some silly jokes (coat with mink pockets in the shape of fried eggs, anyone?) but the handbags themselves scored top points. A soft suede zip-pocketed satchel, a teddy bear-fur rucksack and a leather half-moon shoulder bag were eminently wearable, and just offbeat enough to be compelling.